Figure 1: 3-D diagram of the biosensor, showing the auxiliary/reference electrode block (top), the working electrode block (bottom), and the gasket. This glutamate biosensor has been developed to provide high sensitivity and fast response to low concentrations of glutamate (0.2 to 150 µM) at low flow rate (0.5 to 5 µl/min). The electropolymerised membrane protecting the working electrode virtually eliminates interferences from direct oxidation of electroactive molecules that are present in the brain dialysate (e.g. ascorbic acid, uric acid and monoamines). 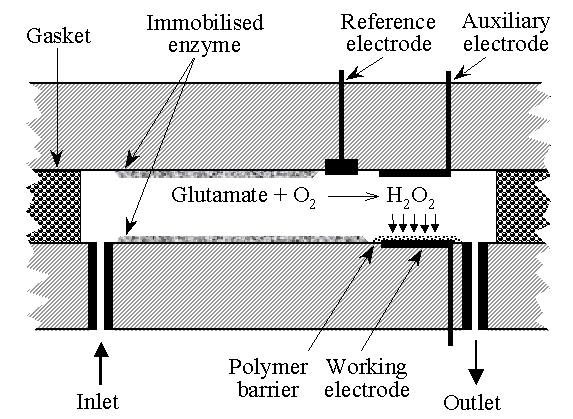 Figure 2: Diagram of the cell of the biosensor showing the electrode configuration, the polymer barrier deposited onto the working electrode, and the surface where the enzyme (glutamate-oxidase) is immobilized. With regard to the long-term stability of the biosensor, the main problem is the electropolymerised diaminobenzene layer on the working electrode, which provides selectivity (i.e. no interference from endogenous electroactive compounds such as ascorbic acid and monoamines). This is a critical issue for the recording of glutamate in the brain extracellular space because the concentration of ascorbate is 2 orders of magnitude higher than that of glutamate. The diaminobenzene layer tends to loose gradually its effectiveness, presumably due to oxidation, and we generally find that from being 99.7-99.5% effective at excluding ascorbic acid immediately after being formed, it becomes only about 99.2% effective after about 2 weeks. Consequently, this is the interval after which we recommend renewing the membrane. In contrast to the diaminobenzene layer, the enzyme appears quite robust and, provided care is taken to avoid contamination and damage to the gelatin/albumin matrix, this does not appear to be a problem during a 2-week period. Extracellular glutamate: on-line monitoring using microdialysis coupled to enzyme-amperometric- analysis. J Neurosci Meth 60: 1-9.